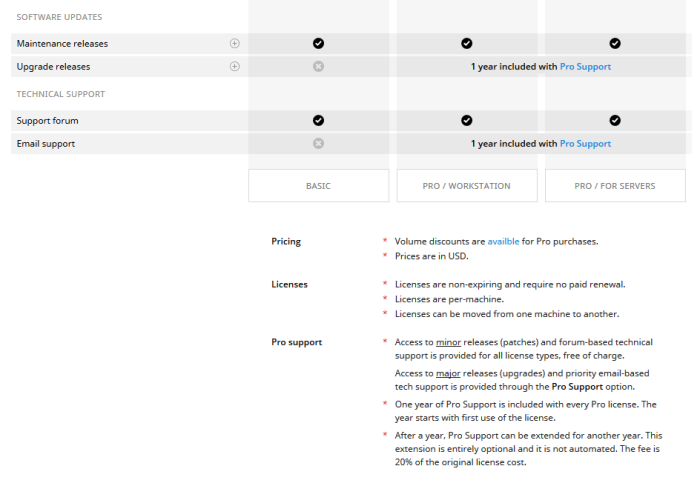 Preview of the Pro Support option for new Pro licenses. Pro licenses will come with a year of Pro Support - an option that enables access to the program's upgrade releases (R80, R81, etc.) and priority tech support. Basic licenses will not have this option, meaning that they can only be used with a program release that was current at the moment the license was issued. Additionally, Basic licenses will be supported through public support forum only. Maintenance updates ("patches") will be provided for all license types, unconditionally. In other words, the bugfixes are on us. After a year, Pro Support can be extended for another year. This extension is completely optional and it's not automated in any way. Extension fee is 20% of the original license cost. See the original announcement for a bit more context.